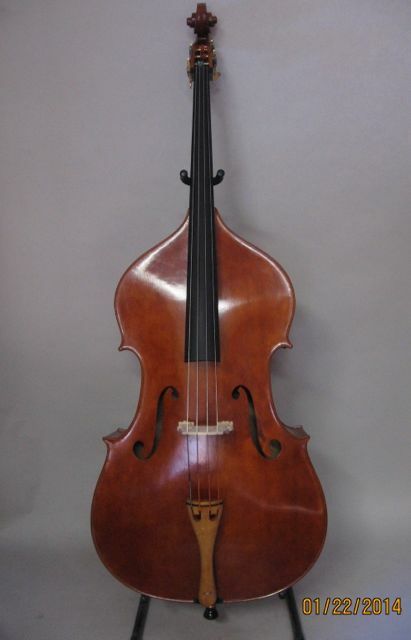 I started building basses in 2000. 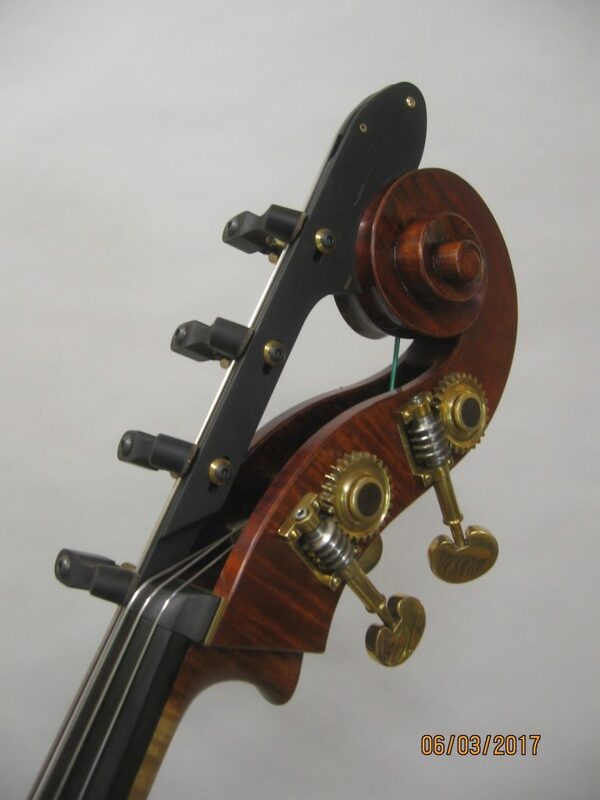 At first, building a bass seemed like the ultimate woodworking challenge. 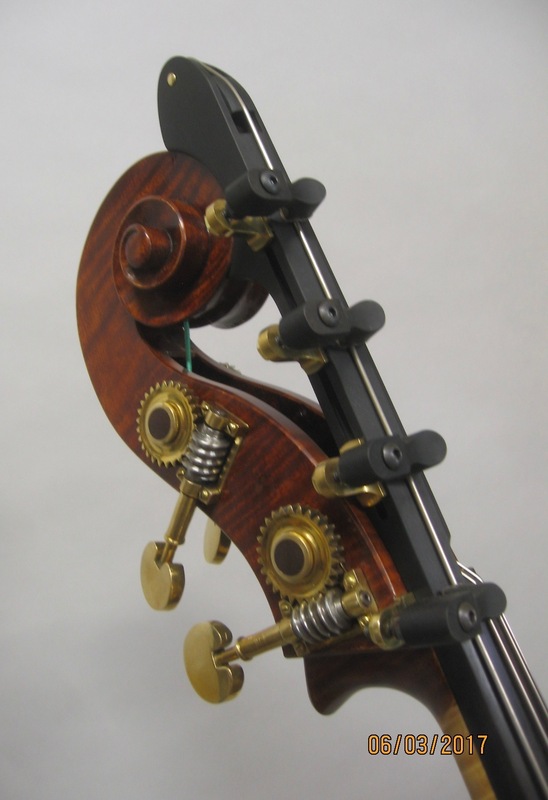 It is still a challenge, but I’ve come to realize that the woodworking is only the first part of making what a bass ultimately becomes. What leaves my shop is a raw bass whose personality has yet to be discovered. It’s the classic nature vs. nurture scenario. 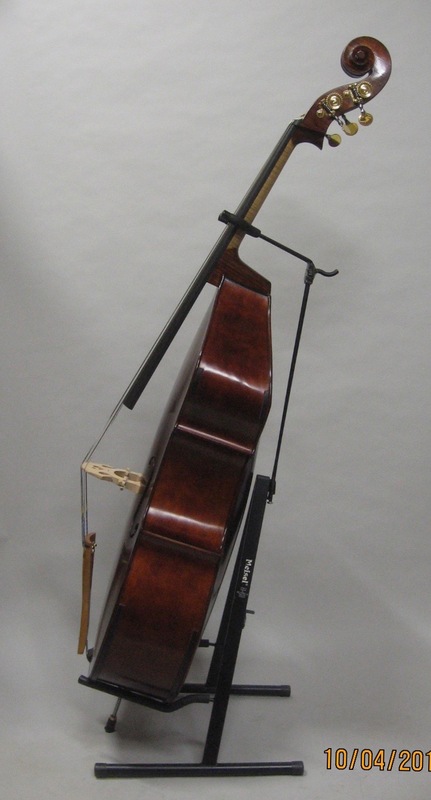 It will take years of playing for this new instrument to come into its own. 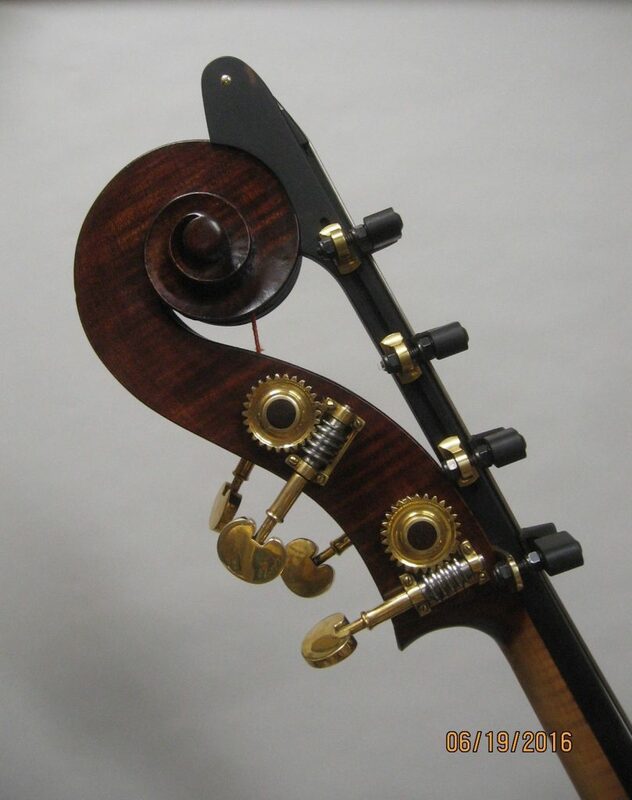 The player who undertakes this project of developing the potential that’s inherent in this new creation will “teach” it to sound in a particular way, and in so doing is as much a midwife as I am in bringing a new instrument to life. As a woodworker I’ve always been interested in using local materials. 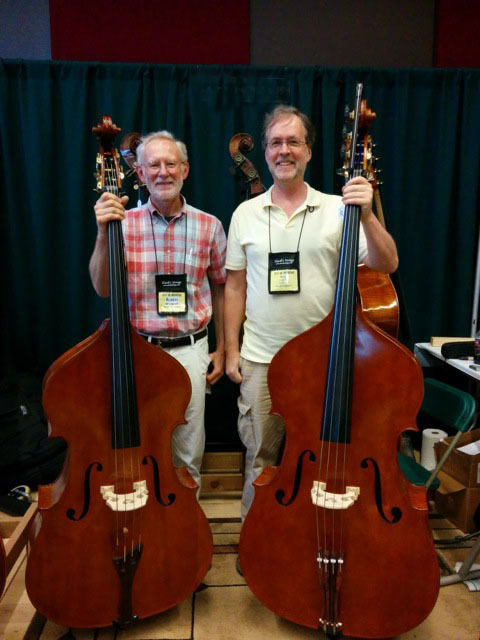 My first four basses comprised what I call the “Taconic Series”, the Taconic Mountains being the ones I look at every day from my vantage point here in Cambridge, New York. 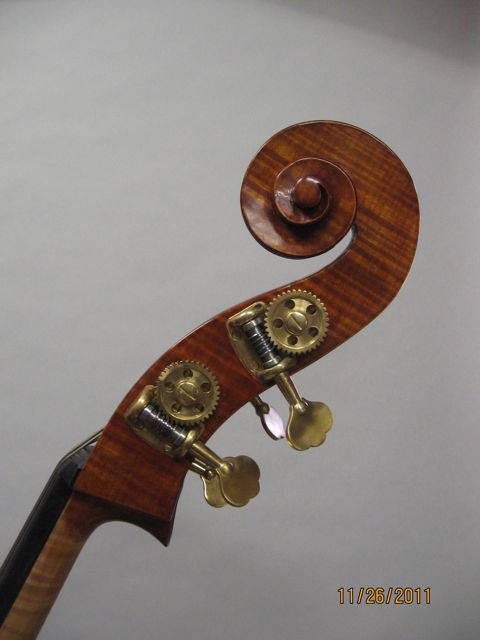 The model for # 1 – #4 is loosely based on the Charles Brugere bass that belongs to Robert Black, a graceful outline with Gamba corners. 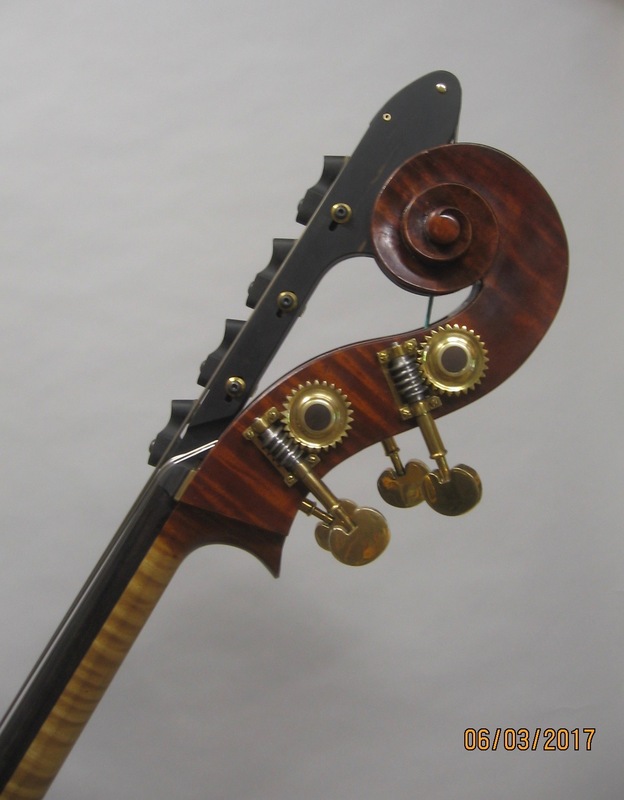 #1 is a Black Walnut round back with red spruce top and maple neck grafted onto a walnut scroll. 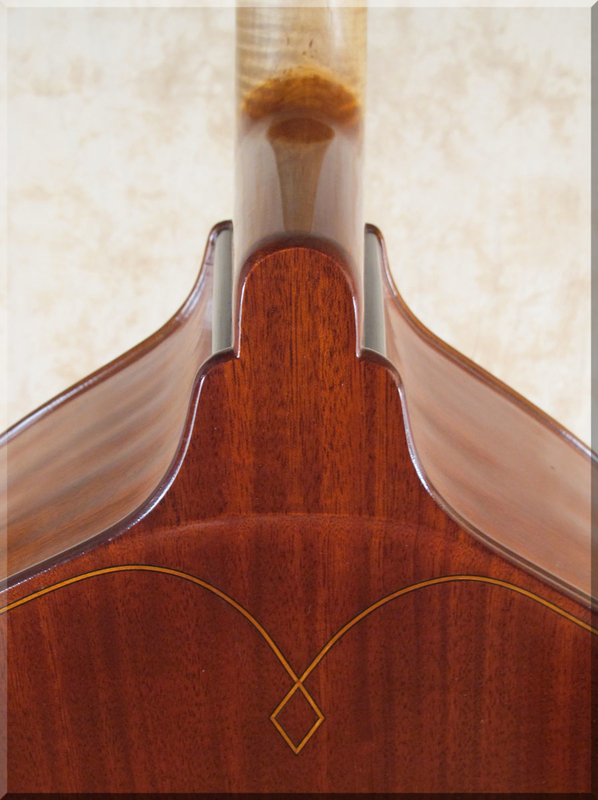 #2 is a Black Walnut flat back with red spruce top and maple neck grafted onto a walnut scroll. #3 is a Sugar Maple flat back with red spruce top and maple neck. #4 is a Sugar Maple round back with red spruce top and maple neck. #5 doesn’t qualify as a Taconic Series, but it’s special because Arnold Schnitzer and I collaborated on the building of it as a tribute to our mentor, Lou DiLeone. It is a Cottonwood round back with Engelmann Spruce top and European Maple neck. The model is Arnold’s interpretation of a Testore that was in his shop, a beautiful, flowing outline with violin corners. 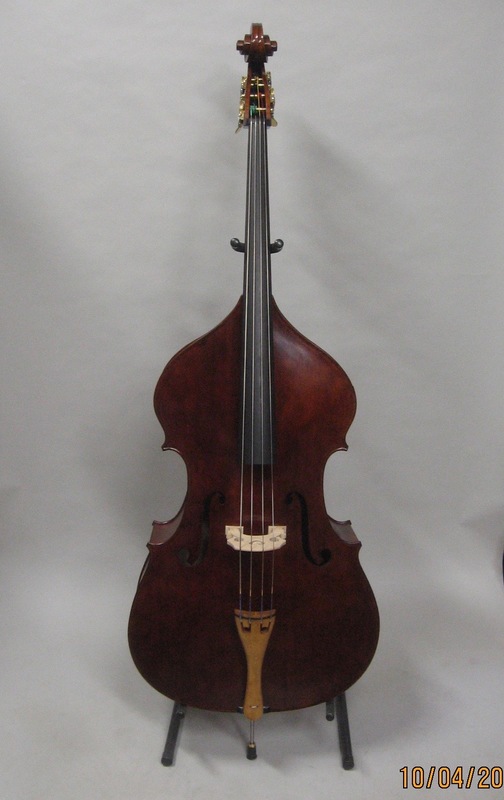 #6 is my own interpretation of several Italian basses that have come through my shop. 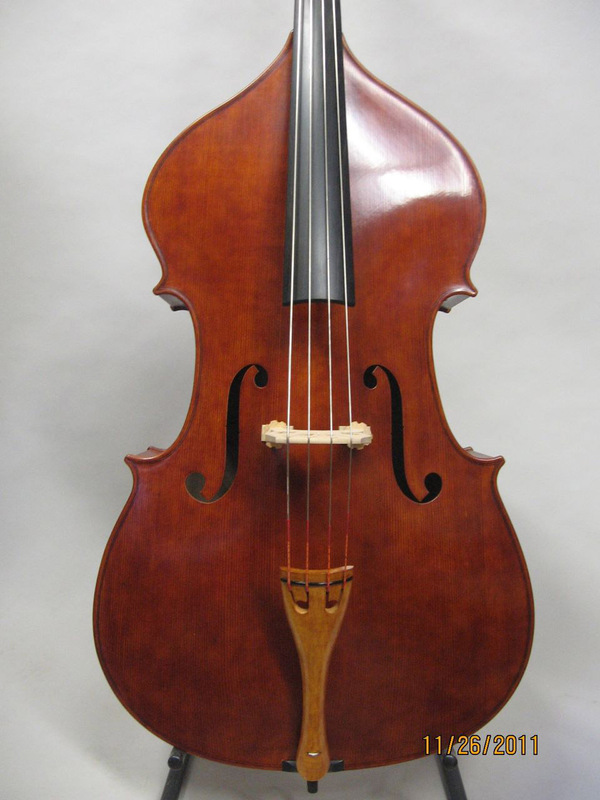 It is a Mahogany round back with Sitka Spruce top and a maple neck grafted onto a mahogany scroll. The Sitka Spruce is from the roof beam of a 150-year-old house in New York City. #7 is a copy of the Alvisio Piattellini bass I restored in 2010. It qualifies as one of the Taconic Series. The top is Red Spruce from Vermont and the back and sides are Cottonwood from our land here in Cambridge. 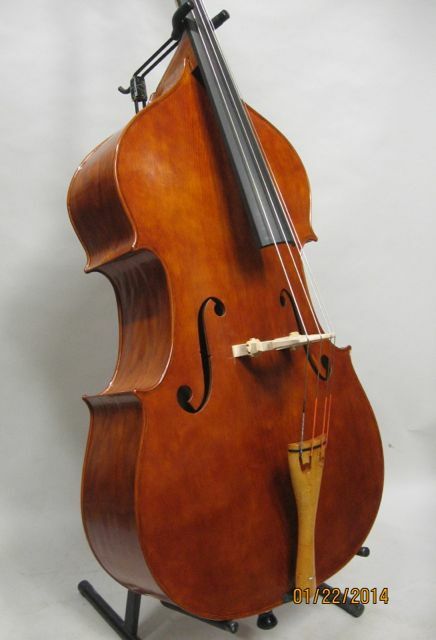 It has a round back and string length of 40″ (101.5 cm.) The varnish is an old-world recipe for oil varnish which I cooked from raw materials. 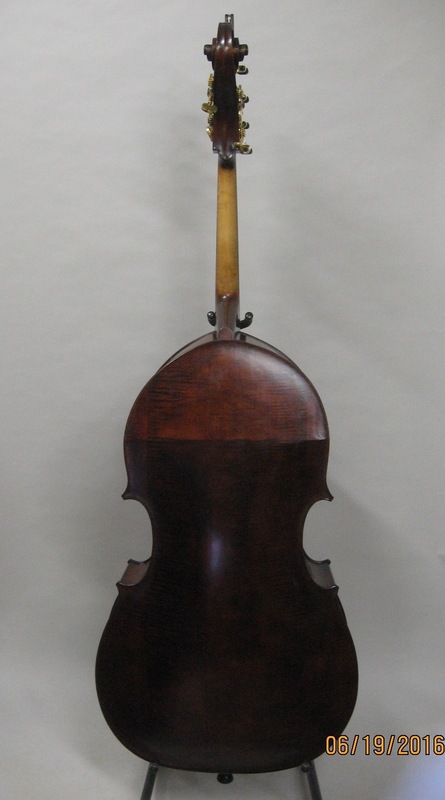 #8 is another copy of the Alvisio Piattellini. The top is Sitka spruce which came from an old house in Manhattan. The back and sides are birds-eye maple. It’s a shallow round backed bass with 40″ (101.5 cm.) string length. Oil varnish as described above. 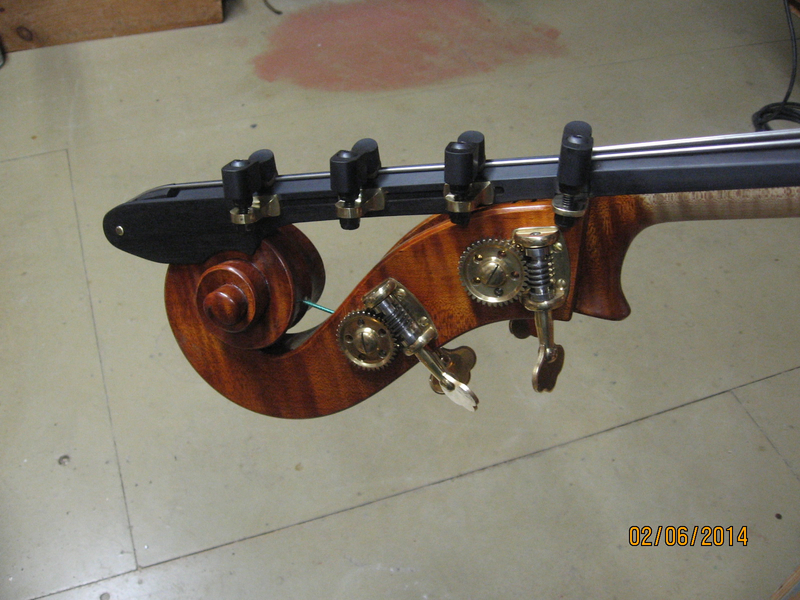 In February, 2014 I finished building #9, a 3/4 size bass which will has a string length of 41-3/4″ (106 cm.) It is an Italian model based on several instruments I’ve measured over the years, including the Piattellini. It has an American Elm back and sides with a one-piece (!) Eastern White Pine top. The pine is very old. It was interior wall panelling in a nearby house that was built in 1785 and dismantled a few years ago. The neck is locally sourced Red Maple. 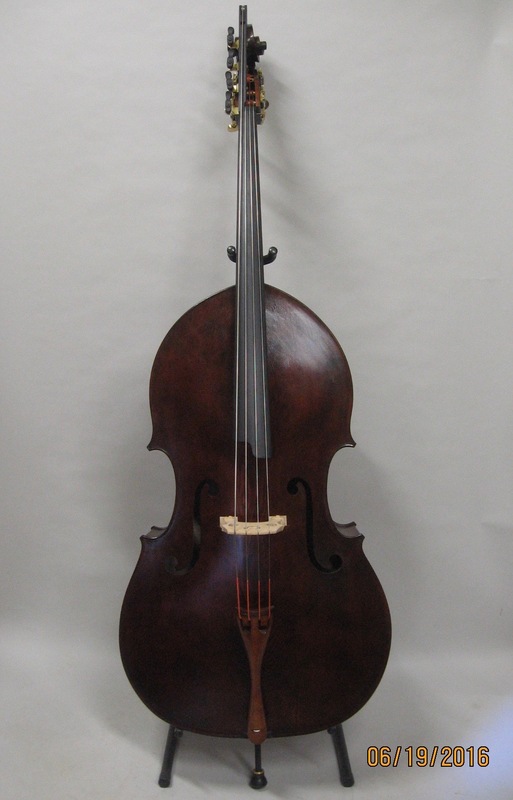 This bass also qualifies as Taconic Series because of the locally sourced materials. 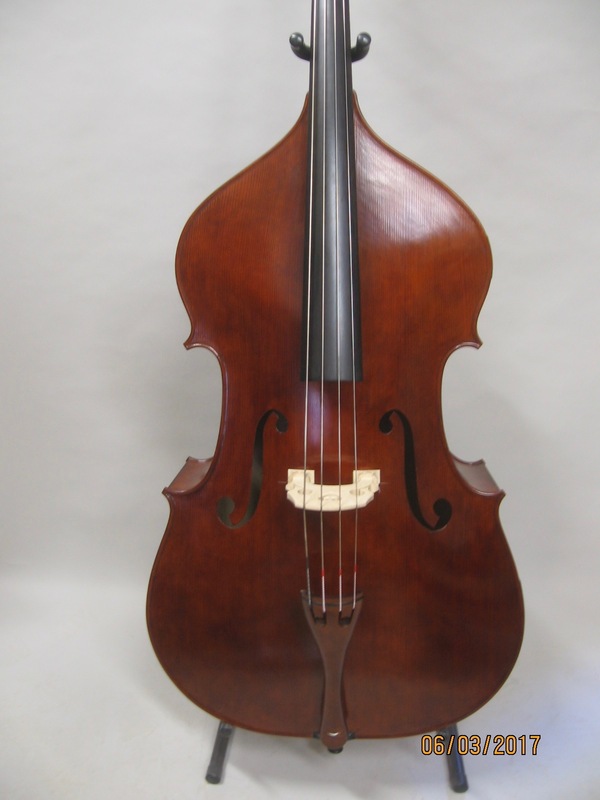 This is McInbass #9. It’s a scaled-up version of the Piattellini with some modifications. 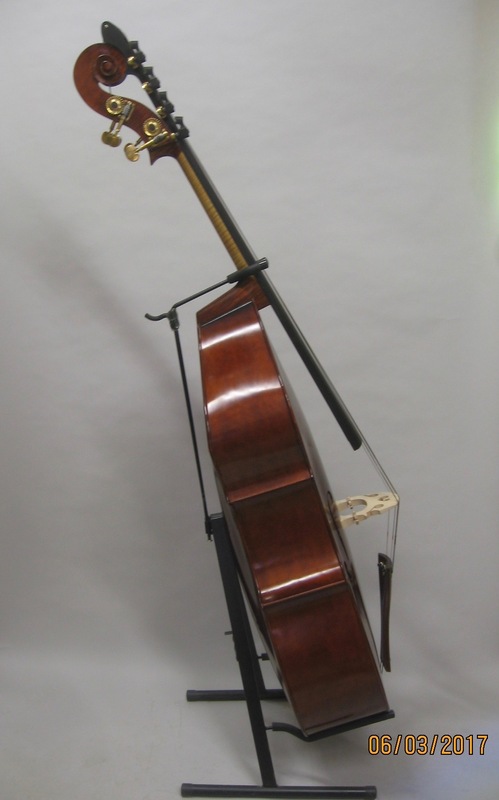 41 3/4″ (106 cm) string length. Slab-cut ribs. If you’ve ever tried to split elm for your wood stove you know how hard it is to split. I hope this curse becomes a virtue by resisting the universal tendency of ribs to crack. Robbie on the left holding #8, Brian Myhr holding #9. 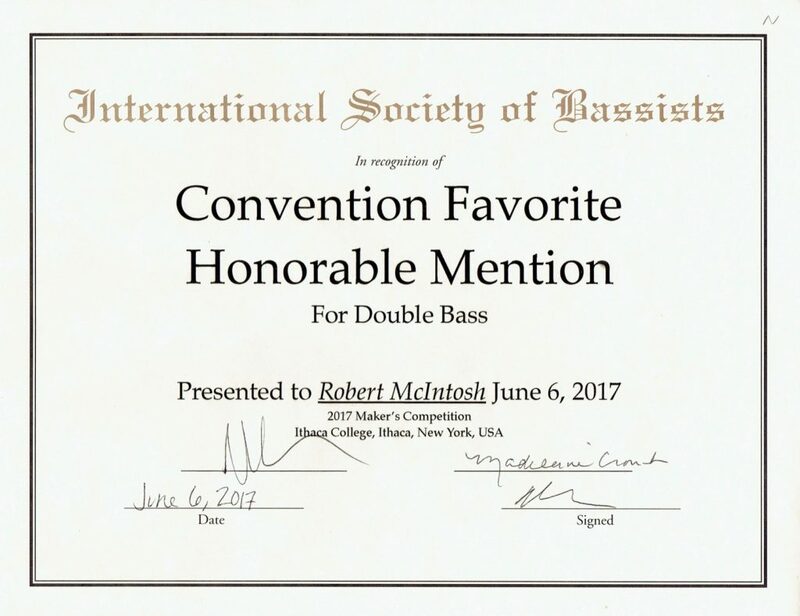 In June, 2016, I completed a copy of Jeremy McCoy’s Domenico Busan (click on “Testimonials” and “Restorations” to see photos of his bass.) 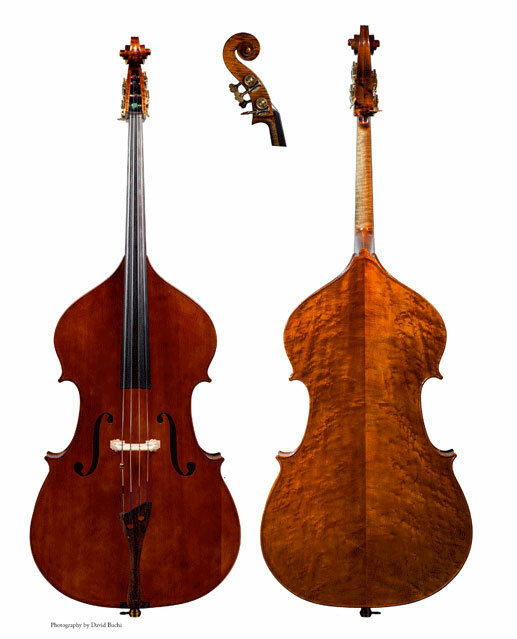 The copy, McInbass #10, is faithful to the dimensions of the original except for two details: a slight change of angle where the ribs meet the neck, an ergonomic consideration, and the height of the top arching, due to the thickness of the pine plank I used for the top. 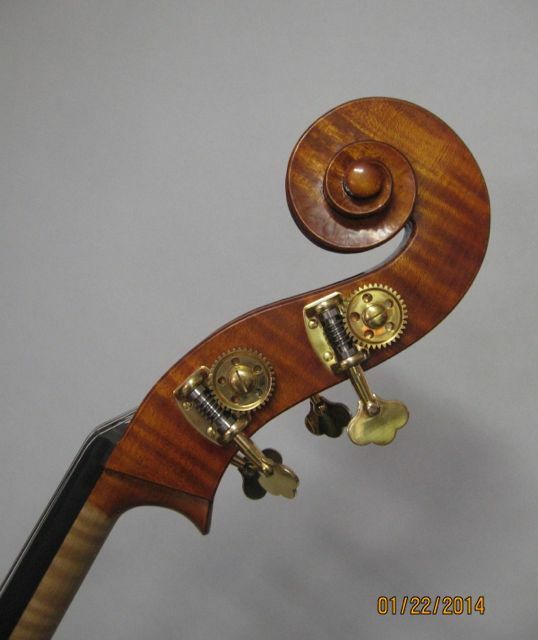 This bass qualifies as part of my Taconic Series as all the wood was sourced locally, except for the bridge and the fingerboard. 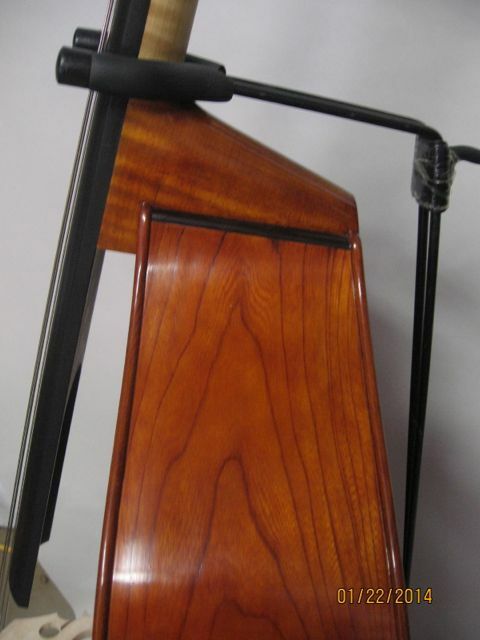 The neck, back, and ribs are Curly Red Maple. The top is slab-sawn White Pine, from a plank that was once wall panelling in a nearby house that was built in 1785. The varnish is an old-world recipe that came from Simone Sacconi via Lloyd Liu. 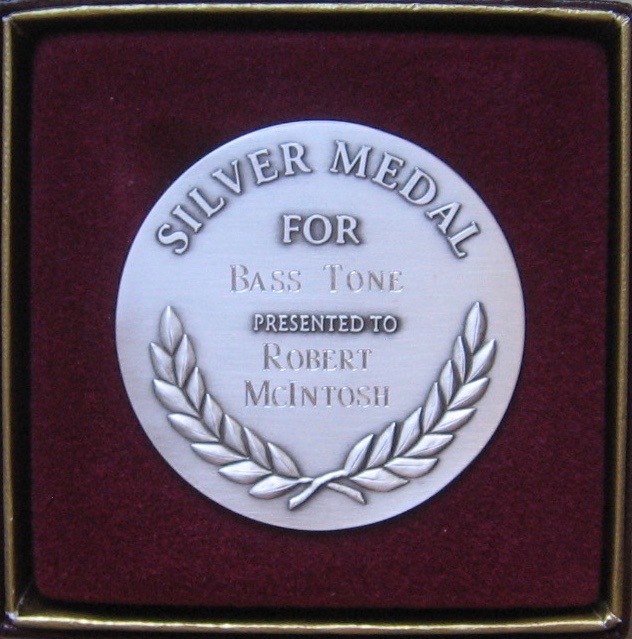 In November, 2016, this bass received the distinction of winning a Silver Medal for Tone at the Violin Society of America convention. Awarded at the VSA’s 22nd Biennial makers’ competition in Cleveland, Ohio, November 17, 2016. 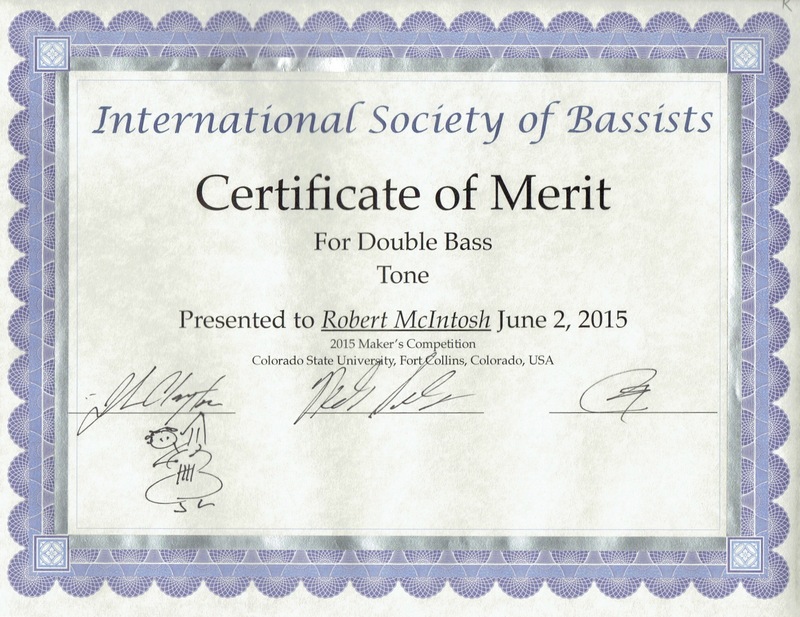 The tone judges were Cleveland Symphony Orchestra bassists Mark Atherton, Scott Haigh, and Derek Zadinsky. 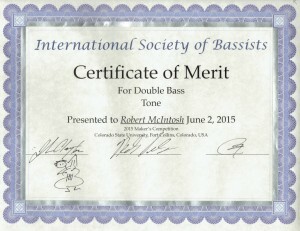 In May of 2017 I completed McInbass #11. It is the same model as #9, derived from the Piattellini. 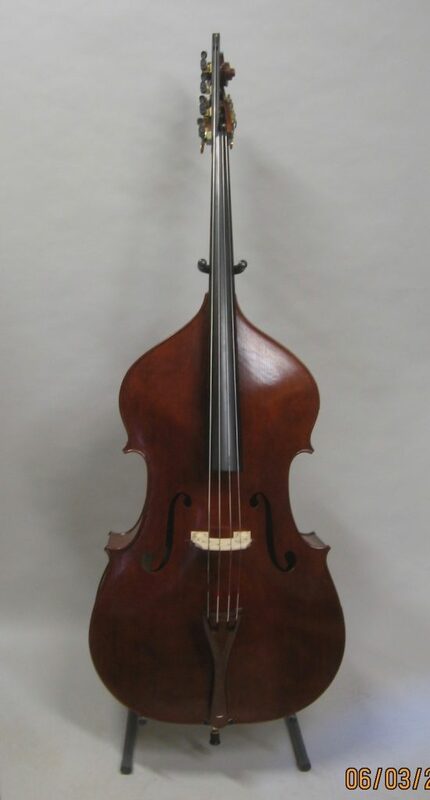 It is made from Cottonwood for the back and sides, Red Spruce for the top, and Red Maple for the neck and tailpiece, all sourced locally so it is the 8th bass in my Taconic Series. In June 2017 I entered #11 into the ISB Makers Competition in Ithaca, New York. It won Honorable Mention Convention Favorite. The Cottonwood is from a tree that grew in the front yard of the house where my wife grew up and had her swing hanging from a limb. 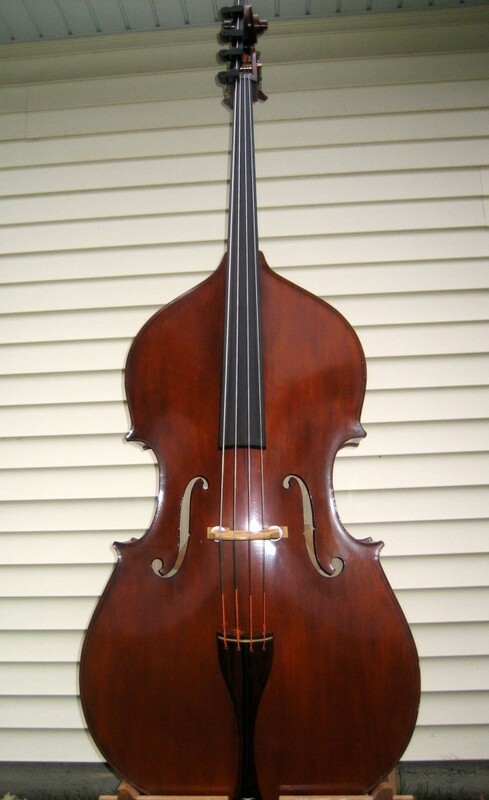 On the label I call this bass the Taconic Swing. 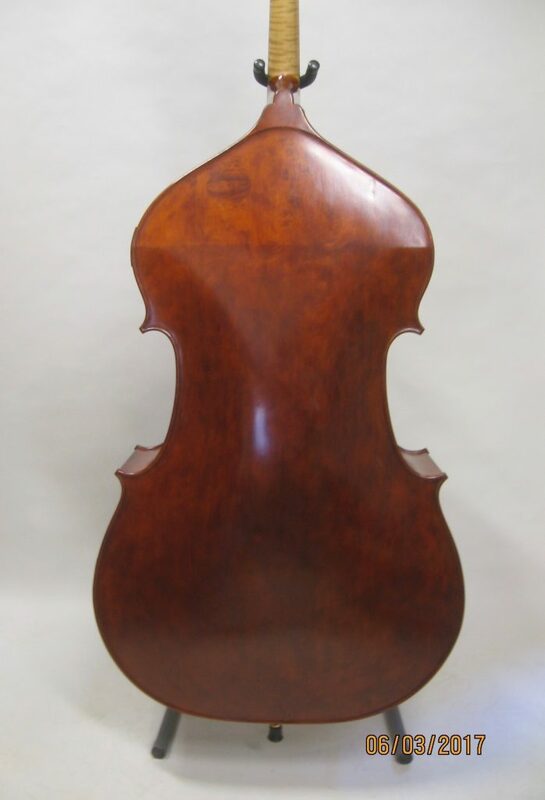 The back is a one-piece slab. 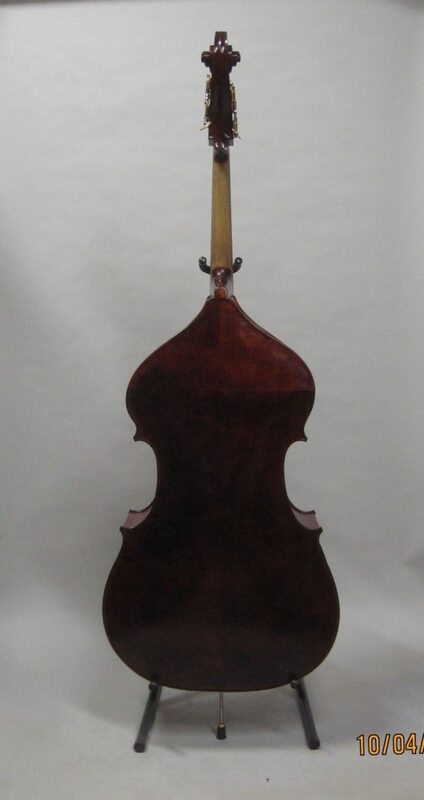 #11 is for sale at the Cincinnati Bass Cellar. In October, 2018, I finished #12, a copy of the original Piattellini. 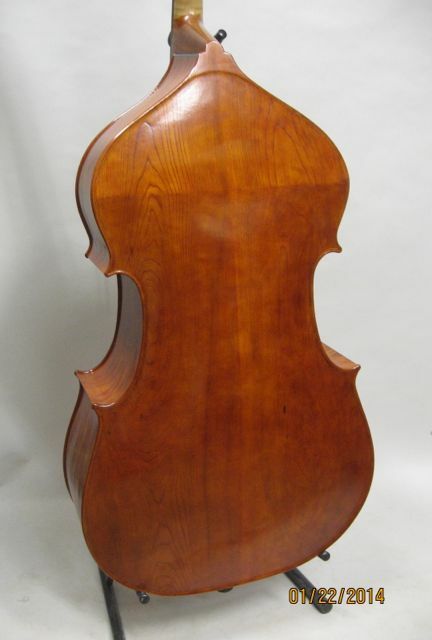 It is similar in many ways to #11 in that it has cottonwood back and sides, and a red spruce top. The neck is curly sugar maple. It is also in the Taconic series. The string length is 39-1/2″ or 100 cm. #12 copy of Piattellini. Red spruce top.